Two standard sizes: Part # 9292 fits up to 24″ x 24″ grates. Part # 9293 fits up to 4 x 6 grates. 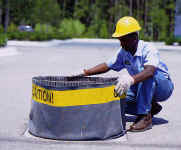 Helps Comply With NPDES, 40 CFR 122.26 (1999) When Used As Best Management Practise In Storm Water Pollution Prevention Plans.